Following the Paris premiere, Evangeline Lilly jetted off to London for the 'Ant-Man and The Wasp' photocall which was held at the Corinthia Hotel yesterday(July 17th) in London. 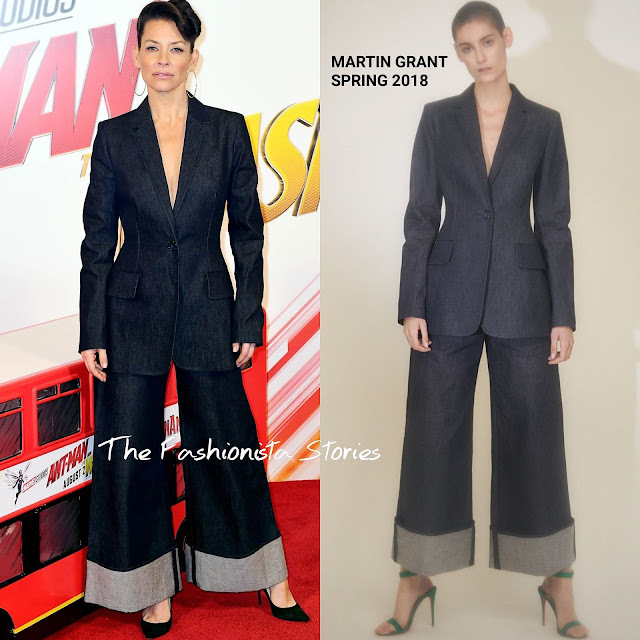 Rocking another suit look, she wore a MARTIN GRANT SPRING 2018 denim navy tailored, notch lapel blazer with the matching over-sized wide-leg, cuffed jeans. In my opinion, this denim suit gives a different take on the power suit look with a retro flare. However the sleeves look to big on her. I wish they had the same fit as the model's. Did Evangeline sell you on this look?